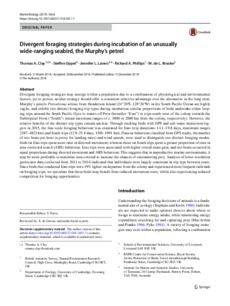 Divergent foraging strategies may emerge within a population due to a combination of physiological and environmental factors; yet to persist, neither strategy should offer a consistent selective advantage over the alternative in the long term. Murphy抯 petrels Pterodroma ultima from Henderson Island (24�′S, 128�′W) in the South Pacific Ocean are highly vagile, and exhibit two distinct foraging trip types during incubation; similar proportions of birds undertake either looping trips around the South Pacific Gyre to waters off Peru (hereafter "East") or trips south-west of the colony towards the Subtropical Front ("South") (mean爉aximum ranges of c. 3800 or 2000爇m from the colony, respectively). However, the relative benefits of the distinct trip types remain unclear. Through tracking birds with GPS and salt-water immersion loggers in 2015, the fine-scale foraging behaviour was examined for East (trip durations: 14.1�.8 days, maximum ranges 2387�23爇m) and South trips (12.9�.8 days, 1565�91爇m). Data on behaviour classified from GPS tracks, the number of wet bouts per hour (a proxy for landing rates) and wind speeds, were used to distinguish two distinct foraging modes: birds on East trips spent more time in directed movement, whereas those on South trips spent a greater proportion of time in area-restricted search (ARS) behaviour. East trips were associated with higher overall mass gain, and wet bouts occurred in equal proportions during directed movement and ARS behaviour. This suggests that in unproductive marine environments, it may be more profitable to maximise area covered to increase the chances of encountering prey. Analysis of lower-resolution geolocator data (collected from 2011 to 2014) indicated that individuals were largely consistent in trip type between years. Since birds that conducted East trips were 19% lighter on departure from the colony and experienced more frequent tailwinds on foraging trips, we speculate that these birds may benefit from reduced movement costs, whilst also experiencing reduced competition for foraging opportunities.